Tonight at 8:30 pm local time, World Wildlife Fund is asking individuals, businesses, governments and organizations around the world to turn off their lights for one hour. They're calling it Earth Hour, and the goal is to make a global statement of concern about climate change and to demonstrate commitment to finding solutions. Here's a great article on it. I'm going to be shutting my lights off for an hour here in Washington, DC. I might even take my wife out for a dinner by candlelight at one of the Earth Hour participating restaurants in the area. 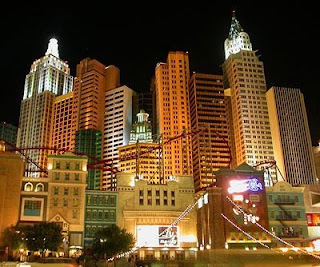 But if I were in Las Vegas, I would take advantage of New York-New York Hotel & Casino’s offer to ride "The Roller Coaster" (the former Manhattan Express). I'll never understand why they changed the name... it's not like morons on the Strip wouldn't know Manhattan Express was a roller coaster. Anyway, the hotel will be running “Dark Coaster” rides with all riders receiving a neon necklace between 8:30 – 9:30 p.m. 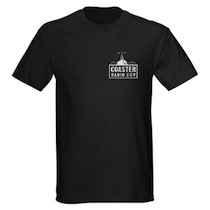 It's a great way to show your support for the environment and get in a few bumpy coaster rides at the same time. But if you can't make it to Las Vegas, I hope you'll join your buddy Mike Collins by sitting in the dark. Manta is the 2nd B&M coaster in my pre-season Top Five and the ride I think will be #1 overall in 2009. B&M Flyers tend to be successful and popular rides. They tend to be as much fun to watch as they are to ride. From the looks of the artwork and the construction so far, it looks like there are going to be some very picturesque moments. 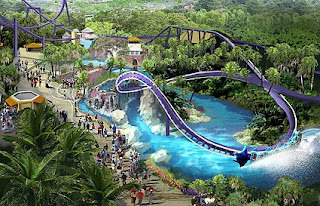 To see the Manta-themed trains kiss the lagoon waters as it twists and turns along the track will be a site to see. 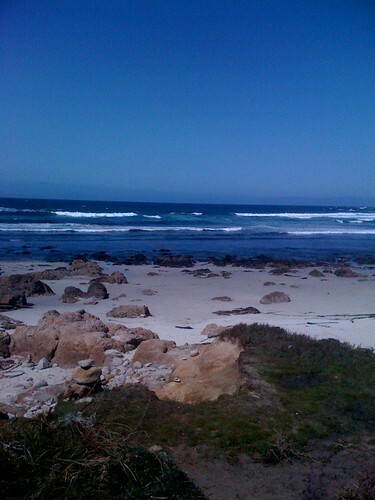 Plus, can you imagine the views from the trains as we fly so close to the water? Also, I think that this is the best theming of a B&M Flying Coaster that we have seen so far. So there they are... my pre-season Top Five. 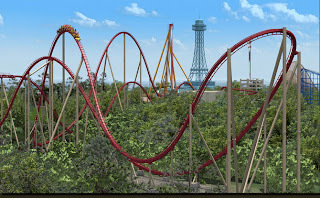 My favorite roller coaster is Apollo's Chariot at Busch Gardens in Williamsburg. I love that it's tall, fast, smooth and has a ton of great drops. Plus, the minimal restraints make it feel all the more like you're flying. The fact that Apollo's Chariot is always in the top 10 makes it seem like I'm not alone in ranking it high. Diamondback, the 2009 roller coaster from Kings Island, seems to come from a similar mold. The ride starts with a first drop of 215 feet and then continues with drops of 193, 131, 129, 110, and 106 feet. It's going to be fast too, with a top speed of 80 MPH. I also like the unique seating configuration that seems to give everyone a good view of the show. I've never been to Kings Island, but this ride makes me want to make the long road trip from Washington, DC. This has nothing to do with the parks, but I thought you guys would enjoy a virtual postcard from California. While I'm not 100% on-board with the fact that Six Flags Magic Mountain has named a wooden roller coaster after a science fiction character made of metal.... I still like this ride. When you watch the ride animation, it seems to go on forever and never lets up. It reminds me of the relentless power of The Voyage at Holiday World. I also really like the station fly-through gimmick. However, I have to wonder if this would get old after awhile if the wait was really long. There is also talk of on-board audio and special effects in the rides queue. This is also the 2nd GCI coaster in our Top Five. I think this is one of those rides that could be really great or tremendously over-hyped. I'm curious to see whether it will remain the the Top Five after the 2009 season is over. I love a good out and back coaster... especially one that hugs the ground more than it climbs though the air. Prowler, at Worlds of Fun in Kansas City, MO looks like it's going to be a winner. 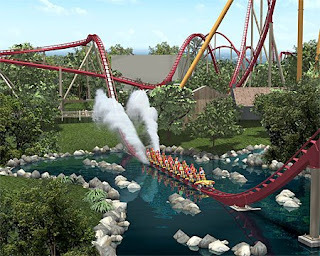 The GCI designed coaster will have a length of 3,074 feet, a ride time of two-and-a-half minutes. The only time it goes above the treeline is during the first 85 foot drop into a ravine. After that, the train rolls through high speed hills and sharply banked turns with a top speed of 51 MPH. Come back tomorrow to see what my #4 ranked ride for the pre-season! In preparation for next week's Pre-Season Top Five Attractions list, I thought I'd give you some of the Honorable Mentions that didn't make the list. It's not that I don't like these rides, it's just that I still need some convincing to put them in my top five. I like the fact that Carowinds is using a new and improved train design to make the ride smoother. Boomerangs are well known for giving a rough ride as the years go on, so it will be interesting to see if it works. Maybe it's not the most exciting new coaster in 2009, but at least it is a new ride for Carowinds. I almost put this in my top five, but I feel this ride needs to prove itself to me. I really like the fact that you can choose your own soundtrack and that you can buy a video of yourself. (How many YouTube videos of this ride will we see this year?) I also dig that the ride vehicles will have color changing LEDs. 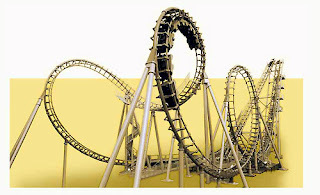 But I think some of the other coasters out there look more exciting. I'm hoping the ride lives up to the hype and the interesting innovations. I think this is going to be a cool ride, but it has very big shoes to fill. The original Monster Plantation was a time-tested classic. Can this new ride improve upon the original? If so, I'll gladly move it into my top five at the end of the season. I'm hoping for the best. 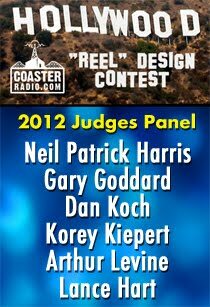 The other day I was reminded that CoasterRadio.com was still podcasting during the first season this ride was constructed. WOW! The fact that this ride hasn't opened yet speaks to the complexity of the design and the desire of Knoebels to get it right. There's no sense in opening the ride if it's not going to run exactly how they want it. But I believe the extra wait is just adding to the anticipation. I'm sure this addition to Hersheypark is going to be top-notch... but you know how I feel about waterparks within the confines of a theme park. I'm completely for a separate gate or enough separation between the water park and the theme park to ensure that I won't sit in puddles on the dry rides. Having said all that though, I really like the looks of Hershey's waterpark area. Very cool theming. Stay tuned... next week I'll release my Top 5, starting with number five on Monday! 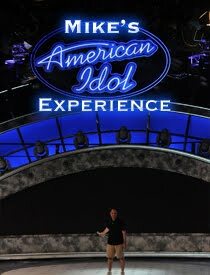 On Monday through Friday of next week, I'm going to be unveiling what I think will be the top five rides for 2009. Keep in mind, most of these rides haven't even been completed yet. But I'm curious to see if my Top Five from the beginning of the season matches my Top Five from the end of the season. I've pretty much made up my mind, but I'm curious to hear what rides make up your Top Five. 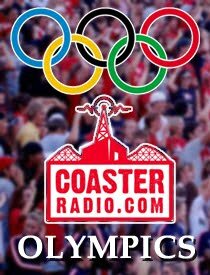 Tell everyone in the CoasterRadio.com forums. 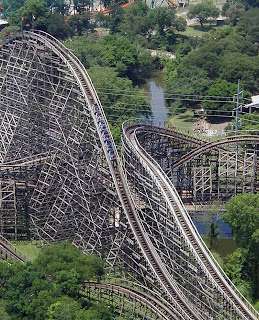 If you love the Texas Giant at Six Flags Over Texas, you better get in a lot of rides this summer... because you're not gonna get any the year after that. 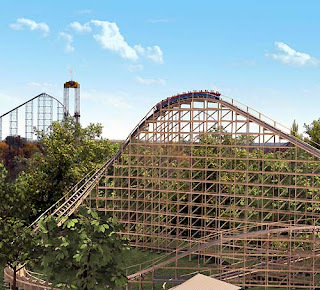 This week, Six Flags announced that it will not open the Texas Giant in 2010. 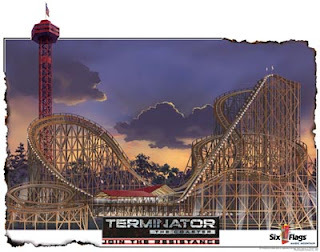 The plan is to perform a 10 million dollar renovation of the monster coaster just in time for the 50th anniversary of Six Flags Over Texas in 2011. The ride is only 18 years old, so I'm not sure it qualifies as a "dinosaur," but I like Six Flags' thinking here. While some won't be happy that a major attraction like this won't be available for a whole season, I think it's a bold move. I like that they are going to really put time, effort and money into preserving a proven classic instead of tearing it down and building something unproven. I'm trying to think of another time in recent history where a major theme park chain has shut down such an iconic ride for a whole year to modernize it and make it a better ride. The only other example I can think of is when Disneyland shut down Space Mountain for 18 months to install a new ride system. Last time I checked, that gamble paid off for Disney. It got me thinking. What other popular ride would you like to see shut down for a year, only to come back bigger and better than ever? It has to be a ride that you really like and would miss. It has to be a sacrifice! Let's talk about it in the CoasterRadio.com forums. We resisted long enough, but now it's time for us to join the Web 2.0 revolution. 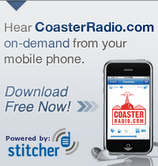 There is a brand new fan page for CoasterRadio.com on Facebook. We have pictures, news and updates about the blog and podcast. You can also follow us on Twitter, where we keep you updated on what's happening with the site, the show and news from around the amusement industry. So Log On, Geek Out and become our "friend" .... Or follow our "tweets".... Or do whatever it is you're supposed to do online these days. I was thinking about yesterday's post and wondering exactly how many theme park attractions are based around time travel. 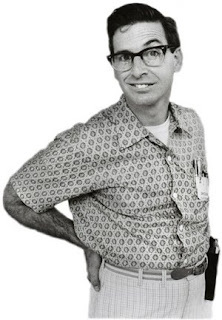 We know of Back to the Future: The Ride and I can think of one more off the top of my head. But are there more time travel rides? Can we make a list and get to at least five? 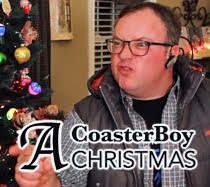 Let's work on it in the CoasterRadio.com Forums. 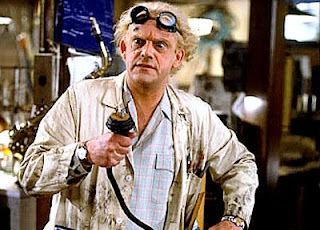 Being a fan of all things "Hill Valley," I bought the Back to the Future DVD set as soon as it was released a few years ago. I know that series like the back of my hand, so I was more interested in all of the bonus features that came with each disc. There were a few glaring things that were missing. Features like a Robert Zemeckis commentary and some clips from Eric Stoltz as Marty McFly would have made it a "must have" part of my media library. I expected those things to be included, but there was one thing I thought they would never release as part of the DVD package.... the original footage from Back to the Future: The Ride. Of course, as you can see below, they have released the trilogy once again and this time, they've included every second of footage from the landmark Universal Studios Ride. I wish I could go back in time and tell myself to NOT BUY the discs the first time around. Anyone want to buy a slightly used Back to the Future DVD set? One of the things I love most about theme parks is watching the rides. Don't get me wrong, I love riding every roller coaster out there, but there is something memorizing about just sitting on a bench and watching coaster trains crest rolling hills, a log ride splashing through the water or a carousel spinning round and round. There are some rides out there that don't look like much, but are still fantastic attractions. For instance, the Wildcat at Cedar Point might not be anything special to look at, but it's a great ride. It's fast, fun and surprising. Space Mountain at Walt Disney World is similar. When the lights are turned on, the ride look very special. It almost looks too mild to be a roller coaster. But once the lights are turned out, forget about it! It's one of the best roller coasters anywhere. However, there are some rides out there that are more fun to watch than they are to ride. Mean Streak at Cedar Point is a mammoth wooden roller coaster and it is really a sight to behold. It was constructed using 1.7 million board feet, and if stacked one in front of the other could span the US from coast to coast just over three times. But when I rode it a few years ago, the experience didn't live up to the look. Mean Streak had its moments, but I was more impressed by the aesthetics of the ride than I was with the actual ride itself. Viper, a ride that used to be at Six Flags Great Adventure had a really unique look. It was a Togo Mega Heartline coaster that was extremely rough, but looked really cool. I always liked seeing trains roll though the metal rings that surrounded the first drop. But I guess every park needs a picturesque roller coaster that looks good on park brochures, even if it doesn't give the greatest ride. What do you guys think? What other rides out there look good, but don't give the greatest ride? About about rides that don't look so hot, but are real crowd pleasers? The other day, a friend of mine at work came down to my office and was very excited to show me this video from a Denny's commercial that was on YouTube. The first time I watched it, I didn't think it was very funny. The second time I watched it, I still wasn't amused. But something made me keep watching this stupid banana again and again and again. As we searched YouTube, we found that people were making their own versions of the NanerPus commercial. There were Nanerpus Horror Movies, Nanerpus Techno Remixed, and some guys even created a pretty good one for an Asian Restaurant. So it got me thinking about the power of viral advertising and how a simple song or character can take on a life of its own. Eventually, a pretty silly idea can bring do more advertising than 100 SuperBowl commercials. Six Flags gave this idea a spin when they brought out Mr. Six a few years ago. They have him a rest for awhile, but have brought him back... even with a new voice. But I'd like to see some of the smaller parks give this a shot. With the economy the way it is, small parks need every advantage they can get to turn a profit. Maybe a park can strike gold with their own version of Nanerpus. Have any ideas for what the next great Viral Video could be for a park?